Will we ever get tired of cutesy design elements hidden in the corners of new cars? Of course not! At least, I certainly won’t. Even if only for an excuse to say something about a modern crossover besides “competent, boring.” Anyway, check out these artistic details cooked into the 2018 Jaguar E-Pace. I’m going to go out on a limb and guess that this jungle cat and kitten silhouette is supposed to be a pair of jaguars; one of the deadliest predators to tree sloths and also the namesake of this car brand. Jeep has been putting stuff in this spot, the windshield surround, forever. There’s a classic Willys in the Wrangler windshield, while the Renegade gets a yeti. The jaguar and baby also make an appearance in the projection of the puddle lamps, but that’s not so much an easter egg as just silly. Material that’s patterned to look like jaguar fur can be found in several spots: in the storage tray below the center stack, in the storage cubby in the center console, and on the airbag tag in the front and rear seats. That’s it. Or at least, that’s all I was able to find. About a million journalists went to Corsica with me to see the E-Pace in person, so surely anything else would have been spotted by somebody by now. 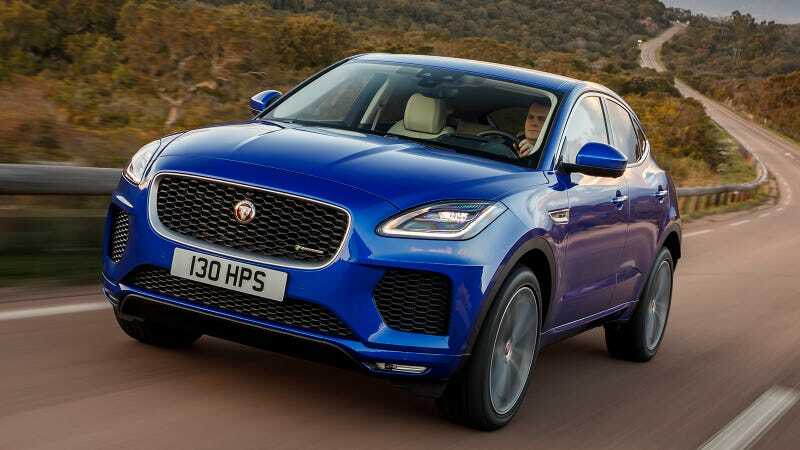 As for the E-Pace itself, it’s totally fine and comes in some great colors. Check out our First Drive for a closer look.